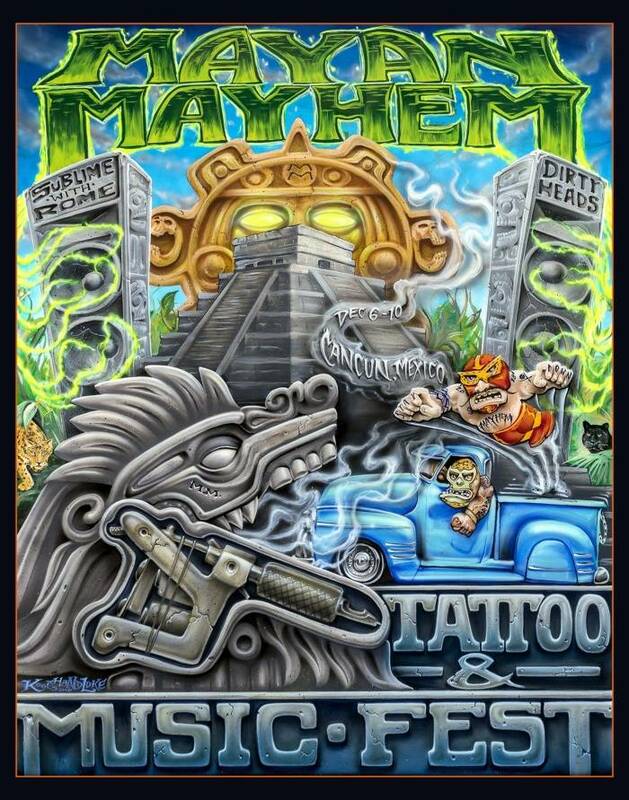 Join us in Mayan Mayhem Tattoo & Music Fest in Cancún, Mexico for the World’s Greatest Tattoo and Music Festival on the Coast of the Beautiful Yucatan Peninsula! The inaugural event features an Incredible Lineup of Tattoo Artists, including many from the Sullen Clothing Art Collective, as well as Nikko Hurtado, Carlos Torres and Ryan Ashley Malarkey. Also in attendance will be some of Mexico’s Best Tattooer. One Tattoo Artist will walk away with the title “World’s Best”. This One-of-a-Kind event is so much more than an average tattoo convention. Located at the spectacular “ALL INCLUSIVE” resort, the Grand Oasis Cancun, Mexico. Resort guests will enjoy the Greatest tattoo party anywhere on the planet. The resort offers 24 all-inclusive restaurants, some of which are rated among the best in the world! When we say ALL INCLUSIVE we mean just that – all food and drinks are included! Other all-inclusive amenities include several hotel nightclubs to keep the party rolling into the wee hours as well as the Red Circus – an unforgettable live experience admiring an exclusive aerial dance show: contortion, mysticism, art, lights, and magic. The icing on the cake are nightly concerts by the beach, where the stage backs up to the Caribbean Sea, featuring internationally acclaimed headline music acts! All the elements combined, offer you a show that will leave you amazed. It just does not get any better than this. Take a break from the stress of the real world and vacation with other tattoo artists and tattoo collectors at an all-inclusive 5-star resort in Cancun, Mexico! Plus other prizes and a Miss Mayan Mayhem contest.